There are numerous applications to surf the Steem blockchain, but one of my favorite apps is eSteem. I've been using eSteem since I joined this platform in 2017 and I can say it has been an amazing experience surfing with the apps (Mobile & PC). This post will discuss the people behind eSteem and the new development of the Android mobile app v2. Then I will discuss the v2 Android app features and the upcoming features of that version. eSteem is a collection of expertise in different fields (developer, UI/UX designer, programmers, tech-savvy etc) developing apps for the Steem blockchain. eSteem has developed PC Surfer (PC app to surf Steem that is available for that is available for most common PC operating systems), eSteem Mobile (Android and iOS apps) with lots of embedded features and eSteem Search (Steem Search Engine). 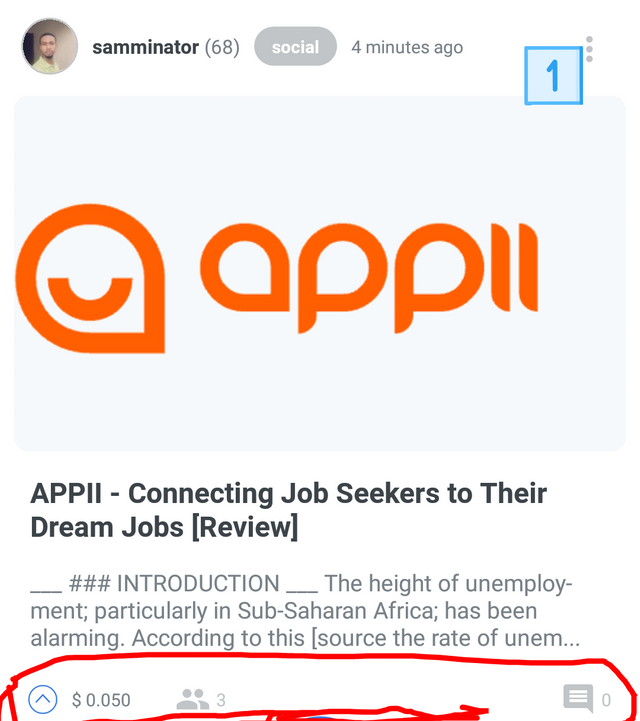 eSteem is presently ranked 8th position on State of ÐApps. 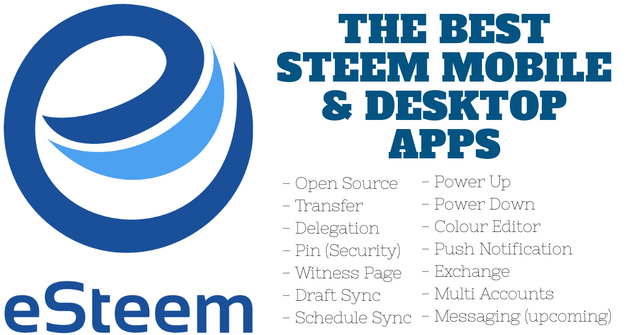 eSteem is available for both Mobile and PC users to surf Steem awesomely. Download for Android from Google Play Store and iOS from Apple Store. Similar to popular search engines (Google, Bing, etc. ), eSteem provides a search engine on our lovely Blockchain "Steem" which focuses on content discoveries through a search with classy features (filter/sort search items, etc.). Access the tool via the URL provided below. eSteem is revamping the Android legacy app from scratch with new UI and additional features. Some people are not aware of the new mobile v2. I urge you to download the new eSteem v2 and explore the speed and UI while development ongoing. The legacy app will be deprecated and removed from the app store after the v2 final is released. There has been a great improvement of the new v2 compared to the legacy app v1. One of the big complaints people make about eSteem v1 is freezing. However, this has been taken care of in v2. The v2 is super fast with no freezing at all. eSteem v2 is still in Beta mode, which means not all functions are working and implemented. You can, however, download it to improve your Steem surfing experience. Let's see the features of v2 and the UI as the developers are working to make the final release. Download for your Android and install. Since the app is still in Beta mode, there are frequent updates in every one-two weeks. Check for updates and watch the @esteemapp account for an announcement. After you've successfully installed, let's work through it. Launch your eSteem app from your desktop. 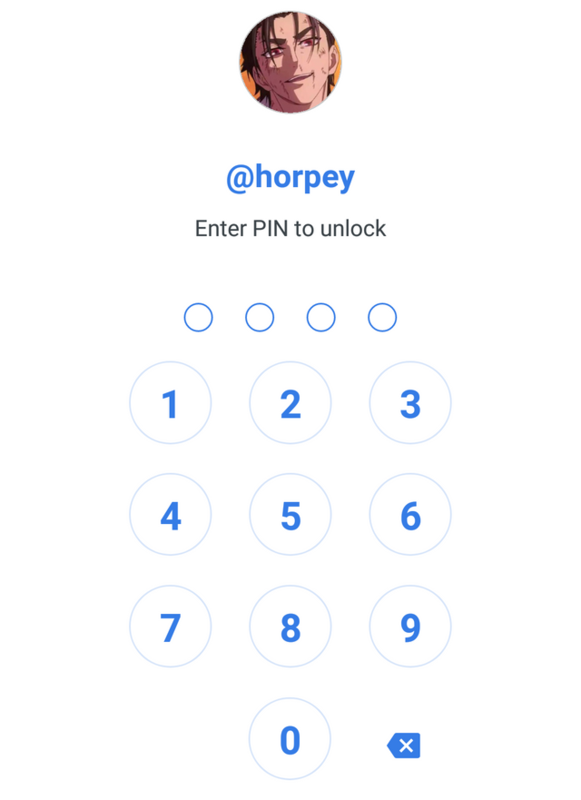 On your first launch, you will be asked to set a 4-digit pin. This pin is an additional security layer to secure your funds. 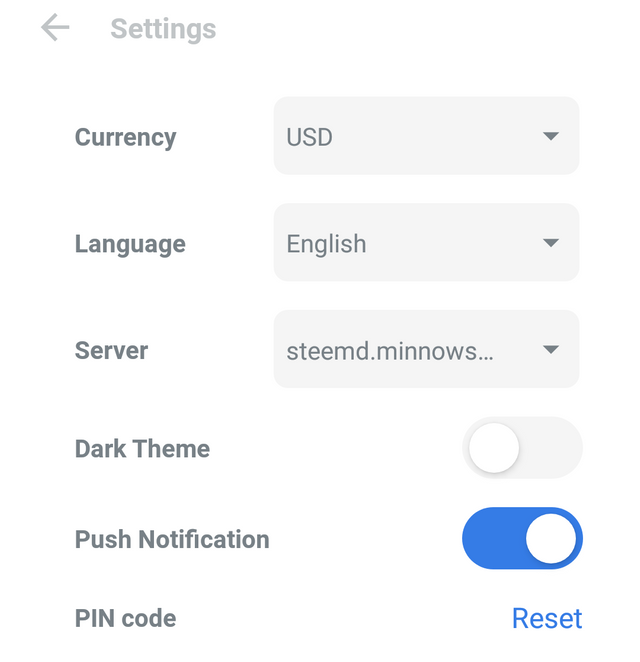 Even if your mobile is compromised by hackers, your Steem account is safe with eSteem. This means maximum security is provided by the app. I'm always happy seeing this feature implemented. Label 1 shows you a menu to access Profile, Bookmark, Drafts, Settings, and Logout. Label 2 is for search. This uses eSteem search engine powered by Hivemind. Label 3 is for switching between card view and list view. I use this feature to save my Data/internet bandwidth when I have limited access. Label 4 is to sort between Feed (people whose blogs you follow) and Blog (your own posts). 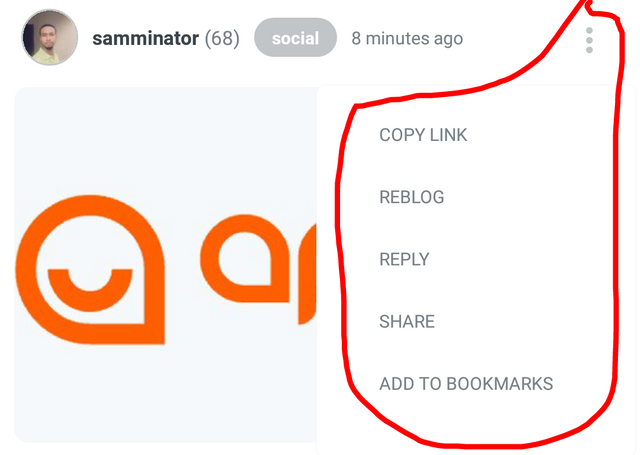 Label 1 gives you the option to copy the post link, reblog, reply, share and to bookmark a post. Label 1 is the button that provides the option to post an article, camera, and video. 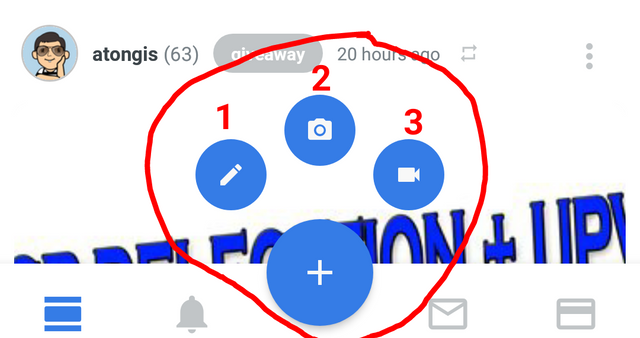 Label 2 is to switch to Feed or Popular posts. Label 3 is a notification tab about your activities. I like this feature as it’s very fast and has an option to sort activity by reblogs, mentions, etc. A sort option is still missing from the list--Transfer--but is reported on Github repo, so I hope to see this in the future release. Label 4 is for messaging. Maybe with this lovely feature on eSteem, I will stick toeSteem for chatting between Steemians instead of Discord. Note: This feature is still in work. Label 5 is for wallet details. Transfer feature is not available yet, but it's available on the legacy version. However, the developer has this on the to-do list on the Github repo. The wallet will also have additional options like power up and down and transfer to savings, which the legacy version does not have. 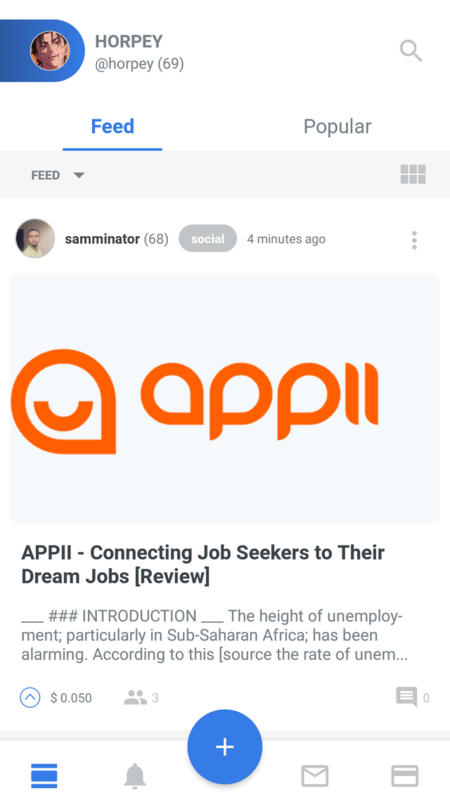 Label 1 gives you an option to write a post. Tapping it will take you to the editor page. Label 2 to snap pix with your Android and post. Label 3 To record video with your Android and post. NB: This feature is not implemented. You can change the default currency from USD to your local currency 💱. Change to a different language. eSteem allows you to change between connected servers, i.e., if a steem.api is down, you can still access and interact with Steem blockchain by connecting to another server. eSteem runs its own dedicated node rpc.esteem.app. Switch between day mode and night mode. Enable or disable push notification. To reset your 4-digit pin. eSteem app is available in varieties of languages and currencies. You can use eSteem to surf Steem while the Steemit API is down or unstable. eSteem provides a PIN for maximum security. You can add a user to favorite for a quick view. Drafts and schedule are synchronized across the PC and Mobile app. Unlike other apps, eSteem does not promote its product with the userbase. Login multiple accounts and switch between them easily. With all the amazing features provided by eSteem, I can say it's the best app to surf Steem on mobile. Thank you for your contribution. I appreciate the time spent in putting the information together. Without a doubt, eSteem is a fantastic project. I have them (Android and Window surfer) installed on my devices. Although, I'm not a consistent user, but I have a lot of respect for the project. I appreciate every information in the post. Though, most of the info is about the features and uses of the app. I have read a lot of publications about the new Andriod V2 app. But, I think, this post gives a more comprehensive detail about it. Talking about quality, I'd advise you use a better image editor in your future publications. The red irregular lines deteriorate the quality of those images. Corel draw, gimp, and other tools could help solve the issue. Furthermore, the post could have another round of polish in the grammar section. Thanks for letting me know about the new mobile version. I just downloaded eSteem v2 on my phone and I'm excited to check it out. Kudos. Please Join eSteem Discord https://discord.gg/UrTnddT to report your feedback. Or create an issue about it in the GitHub repo. The developers are seriously working on it release. Next release will be a gem. Thanks for this valuble information. Hope this next gen of esteem will be one complit and smoothest of dapp. Have great days. I upvoted your contribution because to my mind your post is at least 6 SBD worth and should receive 268 votes. It's now up to the lovely Steemit community to make this come true. Are there multi-image selection and GIF uploading features in this esteem v2 app? Multi-image selection in to-do list while GIF uploading is supported. I love V2 and have learned a lot that I didn't realize by reading your post. It does so much more than I realized. Thank you for this!